We put a lot of stock in politics. And we should. Elections matter. God is indeed on God’s throne. But both of this week’s lesson texts point toward what God is going to do in the future of the people being addressed. The Daniel text encourages people living under persecution by Antiochus IV in the second century BC to look toward the justice that God will do in the future. The Revelation text encourages people living under persecution by the emperor Domitian in the late first century AD to look toward the future return of Christ. The reason both texts point toward what God will do in the future is to encourage God’s people to live faithfully and boldly in their present. We’ll be talking about this lesson on the last Sunday of the Christian year, which the Christian calendar designates as Reign of Christ Sunday. The church affirms that Christ assumed his place at the right hand of God following his crucifixion, resurrection, and ascension. On this Sunday, we affirm that Christ is on his throne and that we can trust that God is working God’s purposes out. We celebrate all that God has done in Christ even as we wait for God to finish all that God will do in Christ. Then next Sunday, on the first Sunday of Advent, we dive headfirst into a month filled with our acknowledging that we are indeed still waiting for God to finish what God has started. We’ve been waiting a long time. We don’t know how much longer we’ll wait. And it doesn’t really matter. It doesn’t matter how long we’ll wait because whether it’s a few days or many millennia, our privilege and responsibility is to participate in what God is doing in the meantime. Our waiting is an active waiting. And since we are Christians, it really should be Christlike waiting, because Christ is on his throne, and we are his loyal subjects. We should remember that as we participate in politics, as we deal with opposition, as we encounter conflict, and as we do everything else we do. One of these days, Christ will make all things as they should be. In the meantime, we serve him by trying to make things better. 1. Many Christians around the world experience severe persecution. How might they hear these Scripture passages differently than we do? Why is it important that we remember them? 2. “All peoples, nations, and languages” do not yet serve the Son of Man (Dan 7:14a). How can we show them the way? 3. In what ways is Christ already “the ruler of the kings of the earth” (Rev 1:5)? How can this be the case for those rulers who don’t acknowledge Christ’s rule? 4. What does it mean that Christ “made us to be a kingdom, priests serving his God and Father” (v. 6)? 5. How should the images in our Revelation text encourage us? How should they challenge us? The specific way in which the “One like a Son of Man” is understood by modern historical-critical scholars varies greatly. For some, he is an unnamed symbolic figure representing Israel—either a faithful group within Israel, or the entire people. This interpretation is based on internal evidence, since in subsequent verses the Ancient of Days is said to give the kingdom to “the holy ones of the Most High” (vv. 18, 21), and “to the people of the holy ones of the Most High” (v. 27). These “holy ones” are understood to be celestial beings, and the “people of the holy ones” are their counter- parts on earth—that is, the faithful ones of the community. The “One like a Son of Man” is equated with them, just as each beast represents a nation. Others argue that he is a particular figure: the angel Michael or Gabriel; a Davidic king or the messiah; Daniel himself; Judah Maccabee; a high priest; or a heavenly figure whose identity is not known. John Collins argues that the “One like a Son of Man” represents the angel Michael, based upon the similar references to angels in the book of Daniel itself (8:15; 10:5; 12:1) and because of the description in Daniel 7 that he is the advocate and protector of the “people of the holy ones of the Most High.” No argument has won consensus. It is clear that the author underscores that God ensures that the suffering community is not forgotten. God will bring about his victory through this mysterious agent—whether celestial or human, collective or singular, is never specified. Sharon Pace, Daniel, Smyth & Helwys Bible Commentary (Macon GA: Smyth & Helwys, 2008) 246. Verse 7 contains a prophetic pronouncement that combines elements from Daniel 7:13 and Zechariah 12:10. The combination of these two texts from the Hebrew Bible is likely not John’s own creation, but a part of early Christian tradition because the same combination, although in reverse order, occurs also in Matthew 24:30. The first part of the pronouncement attributes to Jesus the description from Daniel of a human-like figure (“one like a son of man”) who descends from heaven with the clouds and is given “dominion and glory and kingship” (Dan 7:14). In Daniel, this mysterious figure is likely a reference to the archangel Michael, who in one sense represents the faithful people of God. For John, as for other early Christian thinkers, Jesus is the one who will fulfill this role. 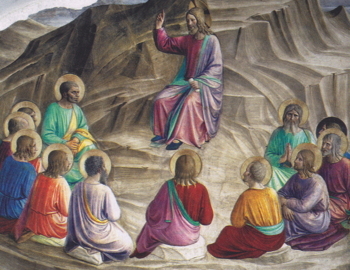 John draws upon this same imagery from Daniel elsewhere in Revelation (1:13; 14:14). John envisioned this appearance of Jesus to be of such magnitude that “every eye will see him, even those who pierced him.” Language such as this is not to be taken literally. This is poetic language. It is John’s way of saying that God’s rule over the world, effected through Jesus, will not be a minor, local event, but an event of universal significance. Mitchell G. Reddish, Revelation, Smyth & Helwys Bible Commentary (Macon GA: Smyth & Helwys, 2001) 36.